Better Know an Office. Inspired by Steven Colbert’s Better Know a District, this recurring series will take us to different Google offices around the globe to learn what makes them tick. In this month’s installment of Better Know an Office, our travels take us to the Seattle area—home of Nirvana, the Space Needle, and lots and lots of coffee. The area is also the home to a big contingent of over-caffeinated Googlers who work in not one, but two offices in the area. That’s right, the second edition of Better Know an Office is a two-for-one-deal as we learn about Google offices in both Seattle and Kirkland! 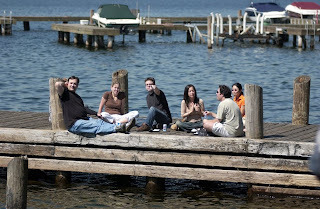 Googlers hanging out on a dock near the Seattle office. But don’t think these offices are clones of each other. Seattle is located right along the water next to one of the city’s most popular kayaking areas. The office keeps its own fleet of kayaks so Googlers can literally walk out the door and start paddling down the Ship Canal and head for Lake Union. For those who prefer to keep their feet on dry land, zip over to Kirkland and check out their rock climbing wall. Regardless of your hobby, if being outside is your thing, then the Emerald City area is pretty tough to beat. With more than 700 high-tech companies in the Seattle area alone, the city has become a hub for an extraordinarily strong and innovative tech industry. With all of this economic growth and energy, it’s no coincidence that Seattle has one of highest percentages of college graduates amongst major U.S. cities. Rock climbing at the Kirkland office. With so many fun things to do in these offices and the surrounding area, what exactly do Seattle/Kirkland Googlers work on? “Asking what everyone does here is like asking what everyone at Google’s headquarters in Mountain View does,” says Scott Silver, Kirkland Site Director. “You can’t pinpoint just one thing.” Some of the better known projects here include Google Talk, Google Maps, Web Apps, and Chrome. We sat down with Scott Shawcroft, a Software Engineer on the Maps team, who works on developing the way Google Maps looks and interacts with 150 million users worldwide. One recent project the team tackled was creating the bike layer of Google Maps so that when a user wants biking directions, the map emphasizes biking-related attributes and gives lower priority to other information that drivers find useful. Scott is just one of the many young engineers working in the Seattle/Kirkland offices who finds the atmosphere relaxing yet inspiring. “The Seattle area has a great technological undercurrent that isn't as obvious as the technology presence in the Bay Area. It’s easy to meet others in the industry here, but it’s still easy to get away and relax”. 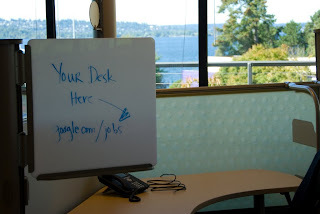 Sounds like a good place to be a Googler to us....and the way we hear it, Seattle/Kirkland has some great opportunities for students looking to be part of some big projects in these beautiful offices while living in one of North America’s coolest cities. If that sounds like your cup of tea (or espresso), make sure to apply today! Stay tuned for the next edition of Better Know an Office! Welcome back to our newest series, Better Know an Office. Inspired by Steven Colbert’s Better Know a District, this recurring series will take us to different Google offices around the globe to learn what makes them tick. Nice and interesting one. Keep it up. Nice post. I really like this post. keep it up. WOW is this really a office. I can work there 24/7 lol.